I have seen the Sign. and it's good! Now that I have your attention. I want to you to know i'm being literal. 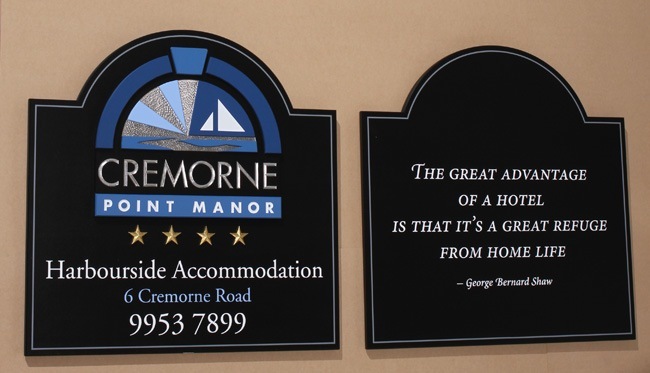 It's actually the new Cremorne Manor Sign. Iv'e attached a photo of the old one and the pending new one. It should be arriving in the next day or so. Also note the little quote on the back of the sign. When you sit in the front balcony of the manor, you've always seen the back boring side of the sign. so I've decided to spice things up a bit and make it more interesting. What do you think? A truly amazing sight. 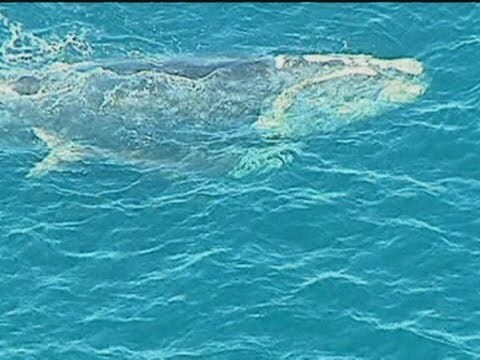 for the past 2 days a Southern Right whale and her newborn calf are currently swimming around in Sydney harbour. it's only the 3rd time on record this has occurred and it quite a sight. 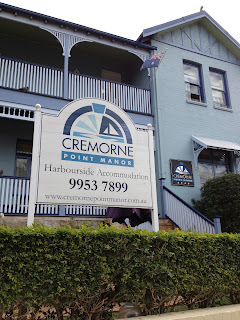 You can see the whale from quite a few vantage points around the harbour (unfortunately it hasn't been spotted from the harbour view rooms at the manor as yet) But you never know. Either way it's a brilliant site and one worth having a look if you are in Sydney. Here is a photo taken yesterday by a news photographer. Now I know it's July and New Years eve is not on everyone's mind. However The manor sells out every year for new years. and the reason is that it's basically one of the very best spots to watch the fireworks in Sydney. The close off the point to non residents after about 3pm on New years eve and you can't bring alcohol to the park. However as a guest of the hotel you can leisurely check in a couple of days before. Enjoy the location and then the absolutely spectacular views from the point. The video above isn't mine, it's just from someone for last year's fireworks. As you can see it's amazing.and compared to the prices the city hotels charge for the rooms. The Cremorne Manor is an absolute bargain. 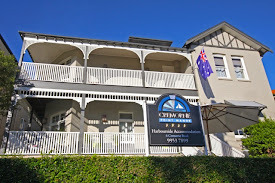 So if you plans incude New Years in Sydney and you don't want to battle: The crowds, the lack of Taxi's, the packed public transport or the huge walk because you can't manage any of the above, then check out the Manor for a few days Rest and Relaxation. We also extend breakfast times for any sore heads from the night before!